38% of breast cancers in the U.S. can be prevented by being active and a maintaining a healthy weight. Despite all of our research, we still can’t predict who will become a victim or exactly when cancer will strike. This adds to the helplessness and the fear we all have towards the “c” word. Yet, in reality, we are not helpless at all. We can prevent almost 90,000 women from receiving the dreaded diagnosis of breast cancer just by making a choice to live healthy. Obesity has become a world-wide epidemic, and the United States is leading the way. We have become a society that thrives on all things fast and convenient. But lets take a moment before ending Breast Cancer Awareness month to think about our health and the changes we can effect to truly make a difference in the fight against cancer. Let’s not focus on the helplessness but instead choose to be positive and make changes that may save our life! We are all at risk for developing cancer at some point in our life, some more than others. Certain behaviors can either increase or decrease that risk. Prevention refers to actions that we can implement to decrease our risk of developing cancer. Here’s what you need to know when it comes to lifestyle habits. Lose weight by eating healthy and exercising. I realize that this is much easier said than done. However, excess body fat was one of the strongest factors linked to increased risk for postmenopausal breast cancer. All it takes is 30-60 minutes a day of exercise…think about how many minutes a day we waste just thinking about what we should do next, or catching up on Facebook…Use your time wisely and make the effort to start exercising TODAY! Getting started is always the hard part. But once you start seeing results (weight loss, energy, self-confidence) you won’t be able to stop! In a recent study, women who followed AICR recommendations decreased the risk of dying early from any disease by about a third, and decreased the risk of dying from breast cancer by about 20%. When it comes to fruits and veggies, deep colors are fashionable all year round! Produce like carrots, spinach, kale, tomatoes, blueberries…are packed with antioxidants that could lower your risk for breast cancer. Antioxidants work by taking up free radicals (bad) that can damage DNA and lead to cancer. And just like your financial portfolio, diversifying is key! When it comes to plant foods more is better but you want to enjoy what you are eating. Eating healthy should not be a chore, it should be an enjoyable part of your everyday. So get to love your veggies and find recipes that easy and delicious! A recent study found a clear link between estrogen receptor (+) breast cancer and saturated fats. Women who consumed the most red meat, butter, and dairy products, had a 28% higher risk of hormone receptor positive breast cancer than those women who consumed less. Substitute animal fats for plant oils like those from olives, canola, avocado and nuts. Trans fats are even worse, and found in packaged foods and margarine. Instead of a charred steak, go for a nutrient rich fresh fish, chicken, or beans for your protein. We all love our cocktails! But too much of a good thing is “no bueno”! More than a drink a day can increase your risk for breast cancer–by almost 20%. If you need a drink (we’ve all been there!) go for a glass of red wine. It is loaded with heart-health benefits that can outweigh your risk for cancer. Some women have a higher risk for breast cancer than others, especially those with a strong family history or known BRCA gene mutations. For those women the recommendations are to drink rarely. You will have to find other ways to de-stress, like yoga or running…or boxing for those rough days! Here are some links to simple, delicious, and healthy recipes with a vegetarian focus to get you started. Remember, adhering to the AICR guidelines can decrease your risk for breast cancer by 20%…there is no drug that can give us that kind of protection! Breast cancer awareness is more than just a month, its a lifestyle and a choice we make to LIVE LONGER and HEALTHIER. So leave your pink bra behind this month ladies. 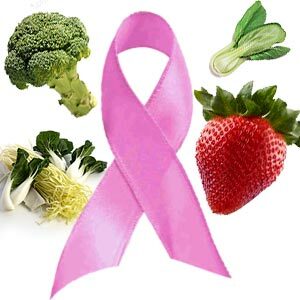 Grab a carrot and a fist full of spinach….LET’S FIGHT BREAST CANCER the smart way! Want more information on the studies discussed?